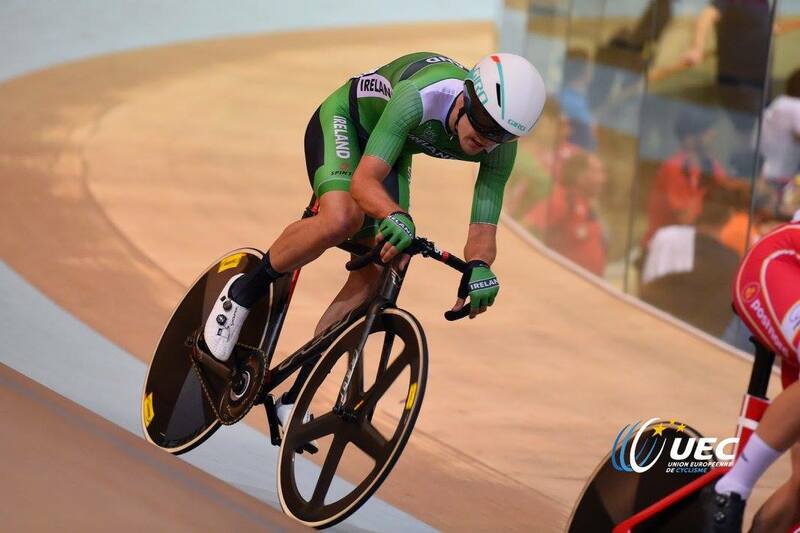 For the third time medal machine Mark Downey has taken a medal at the European Track Championships. The dual road and track ride has taken bronze in the U23 points race in Anadia, Portugal, this evening. That brings Team Ireland’s medal tally to three at these combine junior and U23 championships. JB Murphy has already taken silver in the junior elimination race and Xeno Young took silver in the junior individual pursuit last night. Downey took the bronze this time around in a race won by new European champion Niklas Larsen (Denmark), with silver claimed by Ethan Hayter (Team GB). “I’m really happy to take bronze tonight. It was a hard race, but I knew it was going to be,” he said. “The three of us in the medals were the strongest in the race – the Danish guy was phenomenal. “I know there was a wee bit of pressure on me after the great season I had last year. Mark Downey is a marked man these days having been so successful of late. In 2014 he took junior points race silver at the Europeans and U23 points race silver last year. Since then he has become a real force to be reckoned with. 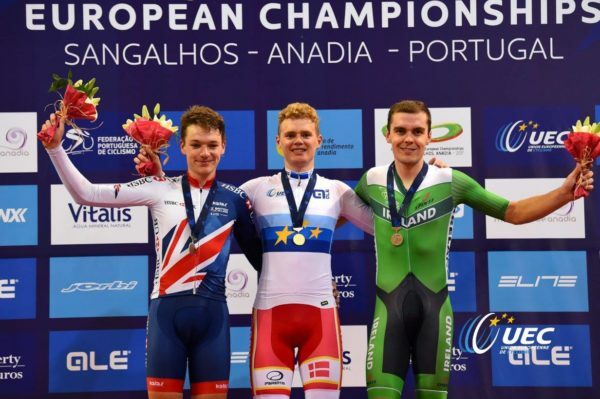 He followed that up with his U23 silver at the Euros last July with a gold medal in the points race at the UCI World Cup in Apeldoorn, Holland, in November. And then another points race gold and a Madison silver medal followed at the UCI World Cup in Cali, Colombia, in February. Downey then won his third gold medal in as many UCI World Cups. This time he claimed gold in the Madison with partner Felix English. This evening Larsen and Downey took a lap early and followed it up with two more, with Hayter did the same. And while Downey was in the silver medal position going into the final sprint, Hayter beat him to the line and the Irish rider had to settle for bronze. He wanted to win the title, but a medal at a major championships yet again extends a magnificent record. “Myself and the Danish guy got off from the start, and really committed to it,” Mark Downey explained of the race. “We took the lap with no real problem, so we just kept going and got three in the end. Downey added the success of Team Ireland so far at these championships was spurring everyone on. Elsewhere at the championships today, Xeno Young very nearly won another medal. He was in 4th place in the omnium. Mullingar’s Nicole Gorry was also impressive in the women’s junior omnium’s points race. She lapped the field resulting in a final position of 9th place. Orla Harrison finished 14th in the women’s junior 500m with a time of 40.201. Racing continues tomorrow with Downey competing in the men’s U23 omnium. Autumn Collins races in the women’s U23 keirin, while in the junior category Orla Harrison and Luke Smith will take on their points races.